Drape's Takes: Blogging: Just Another One of Those "Dangers"
The program will be available in 75 schools in the Jordan, Granite, Salt Lake, Murray and Alpine school districts. The Entertainment Software Association and Web Wise kids will train staff from each district who will return to schools to implement the games that teach students about privacy, bullying and illegal downloading. Web Wise Kids has launched programs in several states, but this is it's biggest group of students yet. While the entire press conference was extremely eye-opening for me, I was impressed by the positive response generated by the various leaders in education present at the event. With representatives from five of the largest districts in the state, each singing praise to the product, who wouldn't be impressed? And yes, Internet safety should be given priority among the crowded curriculum in today's schools. Furthermore, using video games to teach? It's about time! Web Wise Kids’ proven prevention strategies empower youth to recognize and resist all types of harmful situations that exist online. Situations such as social networking, blogging, Instant Messaging, online predators, cyber romances, cyber bullying, identity theft, flaming, piracy and more are introduced in our engaging and challenging Internet safety games. But it doesn't just stop there. Notice anything funny about the banner in the photo below? Yep. There's "blogging". Right next to "predators", pirating, cyber-stalking, and every other online evil - ostensively listed at the top of the two prominent banners displayed. 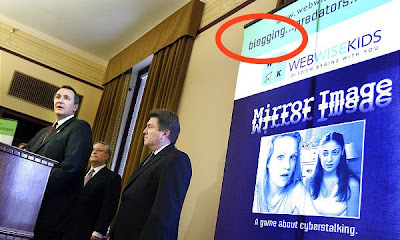 Now, should bloggers be educated about dangers inherent with publishing personal information? Yes. Can blogging, social networking, and even driving a car be dangerous? Absolutely. However, to list blogging among such blatant nefariousness is both wrong and unjustified. There is much good that can come from blogging, participating in social networking and even driving a car. Isn't it time we acknowledged the fact? By the way, if you're interested in an excellent guide to Internet Safety and Social Networking for Parents, I highly recommend the site maintained by Wes Fryer.